They claim this is a true life story and many people are actually confirming that it happened and their close relatives in the village where it took place have attested it happened. This is quite scary and funny at thesame time, I can’t keep all to myself so I decided to share it here…lolz. A man of 104 years gathered his children and adviced them never to put him into mortuary if he dies.He also warned that he should not be buried by any church. 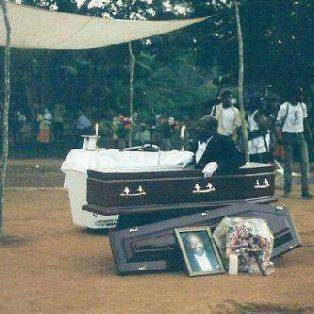 let his cultural group ‘EKPE’ do all the burial ceremony. The children ignored the man’s instruction; they deposited him to mortuary when he finally died, on the burial day, sat. 29th March 2014 at Asaga Ohafia in Ohafia L.G.A, after lying the man in state, the children and their church members brought the casket outside for the preaching. Immediately the presiding minister shouted in Jesus name, the casket broke into two, and the dead man stood up.He walked to the pastor and slapped him. The pastor fell down as the church members ran away for their lives. The dead man asked his EKPE group to take over the burial as he walked back and lay down on the table with his one hand and leg raised up. The EKPE group finished up the burial ceremony. It has also been reported that the pastor died afterwards. This entry was posted in Men, News and tagged A Man Rose From The Dead and Slapped The Pastor At His Funeral In Ohafia. I dont believe. It is scary and funny at the same time. Lol. But the children should have respected his last wish.